Remembered on the Vis-En-Artois Memorial, France and Muston War Memorial, St John's Church, Leicestershire. Jesse Norman born in Muston in 1880. He was killed in action on the 4th November 1918, the last person to from the combined Parish of Bottesford and Muston to be killed in action before the signing of the armistice on the 11th November 1918. His parents were Henry and Elizabeth Norman. Henry Norman was born in Muston in 1829 and Elizabeth in Somerby in 1842. In 1891 Jesse, his sister Dorothy and his parents lived on Village Street. Henry Norman worked as an agricultural labourer and Jesse attended school. By 1901 the family was living on Chapel Lane. Jesse’s sisters Elizabeth and Catherine had returned to the family home and brought a grandchild Henry with them. Jesse was now an ironstone worker. The 1911 census shows Jesse, now aged 29. He worked as a fitter/filler in an ironstone mine. He had married Maud Ash at Saltby in St Peters Church on 12th Feb 1906. She was 28 and was born in 1883 in Saltby. The couple had three children. Emma Josephine Ash, Jesse’s stepdaughter, was born in 1903. Dorothy Lucy in 1909 and Janet Elizabeth in 1911. 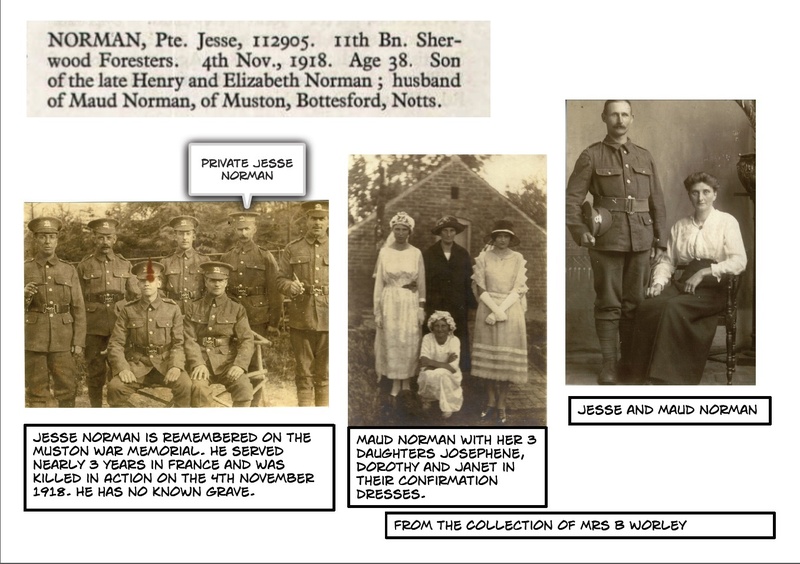 As a married person Jesse Norman was initially exempt from the service after conscription was introduced in March 1916. However, within months married men up to the age of 41 were included in the draft. 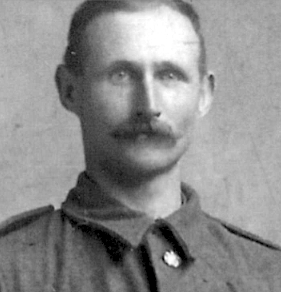 He enlisted with the Leicestershire Regiment in Melton Mowbray at the age of 34 on 11th December 1915. By the time of his enlistment he was a farm worker. Initially he was stationed in Bicester (6/6/1916) before immediate transfer to Rugeley (10/6/1916). He crossed from Folkestone to France on the 23rd December 1916 spending Christmas day at Etaples. He would not experience any future Christmas with Maud and his daughters at home spending nearly 18 months on active service in France until May 1918 with only one two week period of leave in January 1918 (15/1/1918 – 29/1/1918). Shortly after that leave he was ‘re-posted’ to the 2/5 Battalion of the Kings Own Lancaster Regiment on the 5th February 1918. At the end of May (25th) he was hospitalised with a gun shot wound to the face. His family must have experience mixed emotions. He was injured but sent back to the safety of hospital in England, first to Guildford and then to Birmingham away from the front line. Their relief would be short lived. Although the end of the war was within sight there was no let up in engaging the German forces as they retreated and resisted the advance of allied forces. He rejoined the Kings Own Lancaster Regiment on the 12th October 1918 and immediately transferred to the 11th Battalion, Sherwood Foresters on the 14th. Percy Fryer’s history of the 11th Battalion (Service) Sherwood Foresters (‘The Men From the Greenwood’) gives precise details of the fierce fighting he would have experienced. The last month of the war saw extensive engagement with retreating German troops. Jesse Norman joined the Battalion whilst it was ‘at rest, re-fitting and absorbing reinforcements’ some 25 kilometres south east of Cambrai at Premont. On the 17th October the battalion moved three kilometres north east to Maretz. From there they again marched north east 12 kilometres to Le Cateau to wait in readiness for what was described by Fryer ‘as an ambitious attack by the 25th Brigade to gain 8000 yards of ground on a frontage of 2000 yards’. Over two days of fighting the battalion took all its objectives not withstanding casualties from shell, sniper and machine gun fire, (23 killed or missing and 59 injured). After three days in support they moved back into the front line in preparation for another large scale advance of ’25 miles along a frontage of 30 miles’. The first part of their involvement in this advance was to cross the Sambre canal and to capture Landrecies. The Battalion moved forward at 3.45 a.m., on the 4th November. 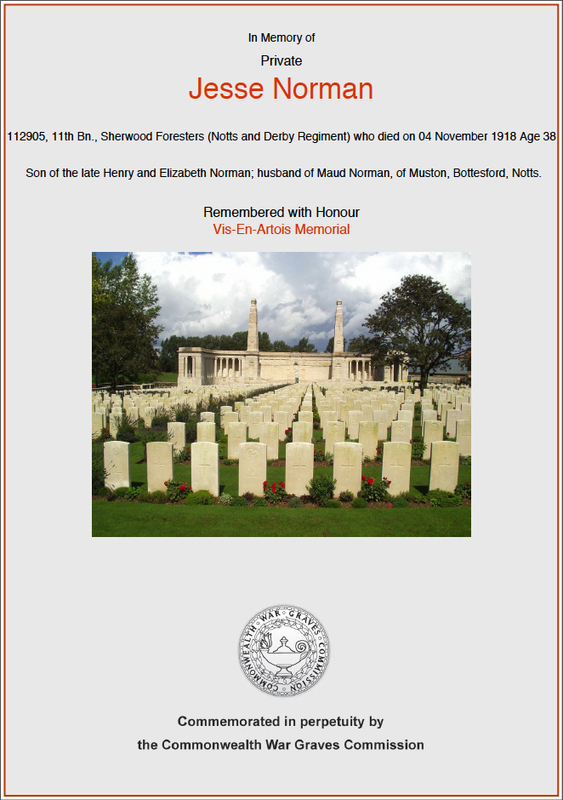 Jesse Norman was one of the fatalities who succumbed to heavy rifle and machine gun fire in the approach to the canal on the Landrecies – Maroilles road – 26 days since his return to front line service in France and just one week before the Armistice on the 11th November 1918. On that day, a short distance south west at Ors, Wilfred Owen was also killed in the action to cross the Sambre Canal. He too had only recently returned to front line service after being in hospital. The Grantham Journal of the 14th December carried the following obituary. Mrs. J. Norman has received the sad news that her husband was killed on November 4th. Pte. Jesse Norman enlisted in the Leicestershires on June 2nd, 1916, and was transferred to the King’s Own Lancaster Regiment. He went out to France, and saw considerable service, being wounded on the 23rd May this year, He was sent to England, and was for sometime in Hospital in Birmingham. On rejoining his regiment, he was transferred to the Notts. and Derbys, and again went to France, being killed just one week before the armistice was signed, Much sympathy in expressed to Mrs. Norman and family. Wilfred Owen’s body was recovered, Jesse Norman’s was not. He has no known grave and is commemorated on the Vis-en-Artois Memorial south-east of Arras in France some 50 miles from where he died. Pte. Jesse Norman is also remembered on the recently restored Muston War Memorial. 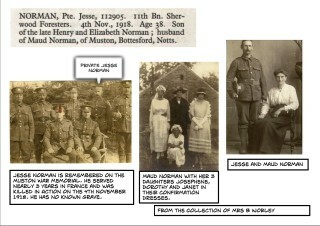 Mrs B. Worley has kindly allowed us to scan copies of family photographs showing her grandfather and family.